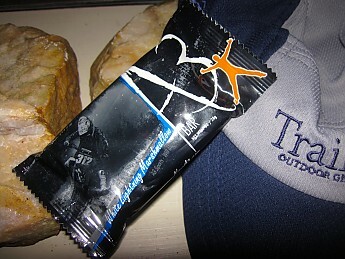 A quick lift is provided from this snack bar—"Anytime, anywhere, anyplace," to quote the packaging. 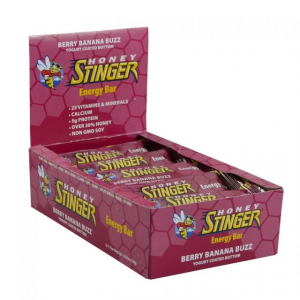 For snacking when energy levels are lagging a bit or hunger is beginning to assert itself. Product seems to match its hype, but at a cost. I received this as part of a Reviewer of the Month prize from Trailspace. The A3 Action Snax line is named after three colloquial adverbials that indicate the recommended time and place one may ingest this product--anytime, anywhere, anyplace (that's the A3 part; I shan't hazard a guess as to where "snax" came from). 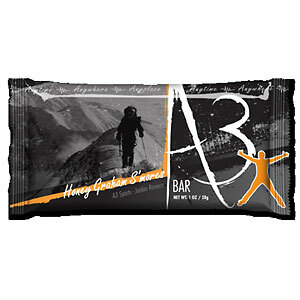 I learn from the A3 website that this product has amazing properties: "Biting into an A3 bar is guaranteed to provide you with essential fuel, complementing the liquid burst [evidently an allusion to energy drinks], and arming you with the ammunition you need to leave everyone else behind. Take it before you head out or throw it in your pocket or pack, and recharge whenever you feel the urge, anytime, anywhere, or anyplace. The world of action sports is evolving, be ahead of the curve and ahead of everyone else." 5:45 AM. To test this product, I woke early to the sound of my dogs barking to be let outside. Okay, this wasn't planned: somehow they had managed to shut the door that gives them access to the outdoor world. Blearily I let them out and made coffee. Then I drank coffee. And some more coffee. My surroundings began to acquire focus, so eventually, after making breakfast for my wife and children, I ate two pancakes on the run and deemed myself ready to begin the test. The rhetoric on the A3 we site is inspiring, so I went outside to ready my gear (see image, below). This piece of gear is not a competition model nor is it the most recent model (no titanium here), but it does assure me a good workout, and I will vouch for its durability--this model is more than sixty years old (I do not, however, recommend it for UL backpackers). In any case, gear in hand, I began to tackle the terrain, which was heavy and wet from yesterday's frequent deluges. As I expected, the surplus of caffeine and the deficit of carbs soon had me feeling a bit jittery. My triceps were burning, my lungs were gulping air, sweat was streaming down my face and back, and I knew that I needed a boost of energy to conquer this terrain. Enter the A3 White Lightning Marshmallow bar. I eyed the remaining unplowed field and then glanced at the packaging: ". . . you are standing on the verge of something spectacular," it told me. "The last thing you want is to crash or hit the wall, nutritionally speaking." 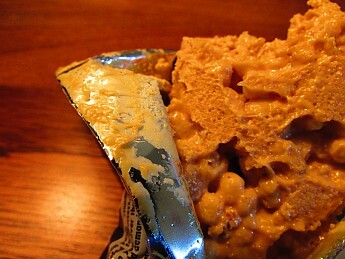 Well, I was pretty darn close to that wall, so I tore open the wrapper (as easy to open as any snack food) to expose the product, which most closely resembled a melted marshmallow and rice crisp treat, save that the color was more peanut buttery in shade. As hungry and shaky as I was, this looked genuinely appealing. Taking a bite, I looked at the nutritional data and the ingredients. The flavor was a bit curious. It began with a rather forward flavor of marshmallow creme, but this was not the same as the rice crisp treat of my childhood. There was greater complexity in the flavor, something a bit malty perhaps (the soy protein crisps or the Manuka honey?). The flavor was not my favorite—a bit health foody—but it was perfectly acceptable, and I'd have no problem eating another one of these. The texture was just what you'd expect, chewy and sticky, but yielding in satisfying fashion to my ravaging teeth. I had no trouble chewing or digesting it and polished this one off in short order. 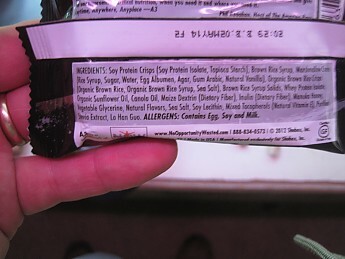 The product is gluten-free, but the packaging does warn about the presence of egg, soy, and milk for those who may harbor allergies to those products. Was I satisfied with the product? Yes, I was. I don't think I'll leave anyone behind in the realm of competitive hand-plowing by virtue of munching on these, but I was pleasantly surprised to see how quickly my jitteriness disappeared, and I did feel a modest increase in energy in relatively short order. When undertaking similarly rash physical exertions in the past with similarly poor caloric preparation, I have felt shaky and had to sit down for a bit. 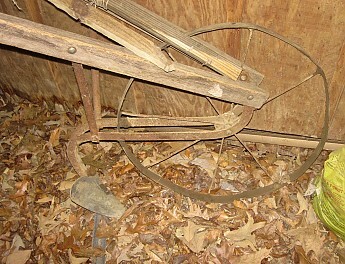 The A3 seemed to nip my symptoms in the bud, and before long I had finished hand-plowing, rowing, and raking my garden. Terrain conquered! For all that the rhetoric on the package and website seems a tad over the top, the A3 White Lightning Marshmallow bar did suppress my hunger and did give me a boost when I needed it during a reasonably intense workout (try hand-plowing a 1,800 square-foot plot sometime!). This energy burst is what I look for from such a snack. 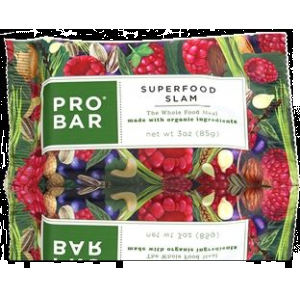 The boost seemed more immediate but also perhaps shorter lasting than other analogous snack bar/energy bar products: I did not get jittery again, but more than an hour later I could detect the edge of my hunger returning. The A3 bar is, then, perhaps best used to tide one over when the trail to camp was a little longer than expected or when elevation gain was more brutal than one had first thought. I liked that the A3 bar wasn't heavy–I didn't feel like it would slow me down at all, and my experience bore this out. It would be a nice, quick snack on the trail. At an online price of $2.20 for 28g, it seems a bit pricey to me, as though one might be paying as much for the hype as the product, but online retailers seem to have them for about $1.61 if you buy a 12-pack, and that may be closer to a reasonable value (although, to compare it to another familiar bar, I've seen Clif bars multipacked online for $ .95/68g unit cost). In any case, my experience with this was positive enough that I may try the A3 Honey Graham S'mores flavor in the future—my quibble is more with cost than product, as the product did see me through my exertions to produce something spectacular--here's hoping my summer produce will make these spring exertions pay off! Marshmallow creme--yuck! The garden looks to be off to a good start. Yes, I think the S'mores may be more my taste. As for the garden, we'll see. I have been known to grow some amazing weeds! Nice review, Bentbrook. 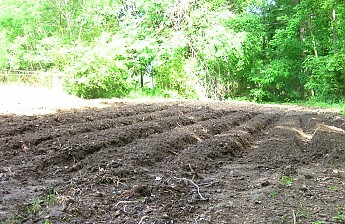 If you need more training opportunities for competitive hand-plowing let me know, I've got some gardening you could help with. I recommend the S'mores one. I liked it a lot. 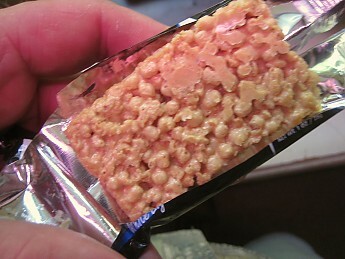 Small, three -bite, marshmallow soy crisp bar with a slight nutty undertone. The usual stickiness of marshmallow rice treats applies here! Don’t leave in your car unattended! 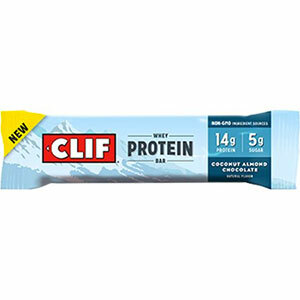 Calories/nutrients-to-weight, it works as a trail snack as long as the taste suits you. I received this as part of a Reviewer of the Month prize package from Trailspace, thanks TS! Bentbrook’s review on 5/11/14 hit the high the nail on the head with the pictures on the ingredients and nutritional information. I took the same pictures and remembered that he had them too along with some funny anecdotes, can’t do much to improve on that! My wife and I just tried the bar after mowing the lawn…anti-climactic, I know. 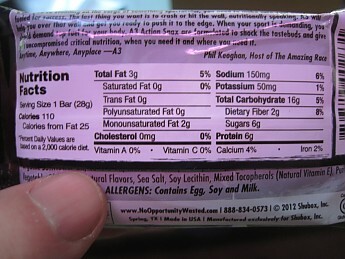 It does contain soy, eggs, and milk, so note that. It is small and lightweight though, being about 3” long by 2” wide and weighing 1 ounce per the packaging. It meets the old standard of at least 100 calories per 1 ounce of weight as it comes in at 110 calories. It also has some other unexpected nutrition given its size, weight, and components: 6g protein and 2g fiber. Though remember these are soy crisps and not rice crisps, so more benefit comes from that than rice treats. The texture is just like a marshmallow rice treat, but slightly firmer. It does have a different (unexpected) taste and smell. Nutty is the best way to describe it. I’m a fan of peanut butter snacks, but this is just a bit off from any typical PB snack. Another major aspect was how sticky it is, though that’s to be expected. For being around 80 degrees it melted a lot and was very sticky on the wrapper as well as my teeth. The thing is: do I want this to happen on the trail or at a family picnic? I figure there are plenty other delicious flavors out there, but this wasn’t necessarily disappointing nor above expectations, 3/5. 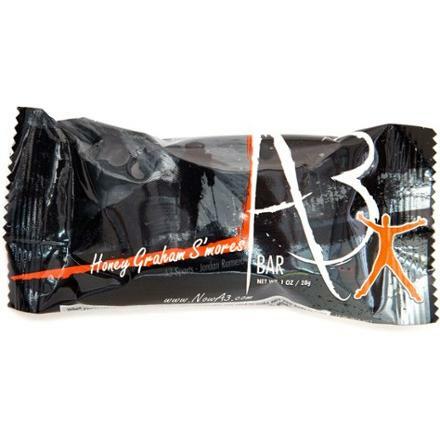 The bar will give you the calories you need at a light weight, but the flavor isn’t all the way there for me. I’m always game to try new things. My wife and I both tried it and came to the same conclusion. There’s only so far that the nutritional information can take you without the taste or texture just overwhelming it; in this case, it’s a bit negative. Would I turn one down if offered? No. Though, would I buy this flavor in the store? No. Jeff, out of curiosity, where have you picked these up before? Didn't know if you knew places with a better selection or price than others. Thanks in advance! I got mine the same way you got yours. I haven't seen them in stores yet. Yes, the s'mores one is solid! Nice job, Daniel. 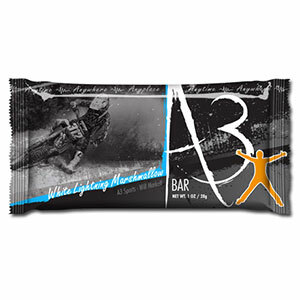 The A3 White Lightning Marshmallow Bar is not available from the stores we monitor.